The title of this post is a nod to The Legend of Boggy Creek, a 70s-era cheesy pseudo-documentary about Bigfoot. I'm not a believer in Sasquatch, but I would not have been surprised to encounter one on our hike to Munsen Creek Falls, not far from Pacific City in Oregon. We were hiking a ravine. 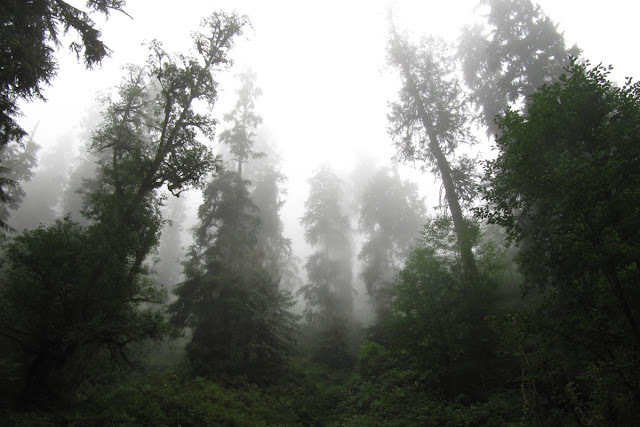 Tall trees on the hills to either side were mere silhouettes in the thick veil of fog that obscured everything. We could hear nothing -- not even birds -- in the indistinct forest. The idea that some sort of giant man-apes could be watching us from the gloom came up in our conversation. The falls themselves couldn't be reached due to the fallen logs and slippery rocks that block access. We could only view them in the distance through the curtain of mist. The falls are about 320 feet high and one of the tallest waterfalls on the Coast. On a sunny day, I'm sure they look beautiful and are often admired by local Bigfoots.